After having survived freefall on my 30th birthday, I was reminded that I still had so many sandwiches to taste yet in life, and what better time to take on one I had been postponing for quite some time. Having relatives visiting me for my birthday, I decided to take them to a swank little eatery known as Joan’s on Third in West Hollywood. 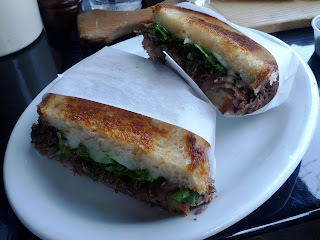 Taking a seat at one of the sidewalk tables, I anxiously awaited my Short Rib sandwich. Now Joan’s has an amazing selection of sandwiches, and from what I hear, most are amazing. So if you are interested in trying this place out, but not dying for a short rib sandwich, you have plenty of excellent options. Pulled short rib, melted jack cheese, arugula and sweet red onions stack up between two slices of grilled country bread. The short rib had definitely been cooked down the right amount of time. It just about fell apart when I bit into it, without being too mushy or ending up too dry. Since the rib meat was pulled, the melted jack cheese permeated the whole sandwich from bread slice to bread slice. The country bread was lightly buttered, lightly grilled, and highly delicious, adding a bit of crunch to the otherwise softer insiders of the sandwich. I’m still not sure why I delayed so long in eating this sandwich as it was definitely highly enjoyable, delicious, and worth a second trip. The sandwich is very similar to the sandwich i reviewed at 8 oz. Burger Bar back in December 2010, but I feel like Joan’s version of the sandwich slightly edges out that one. Like I mentioned before, Joan’s has an incredible deep menu listing that can satisfy almost any customer, so if you’re in the area you should absolutely check it out. But if you’re looking for what most people (including myself now) consider the pinnacle of their sandwich mastery, you’d do well to try the Short Rib Sandwich. In other sandwiching news, I will be heading back to Philadelphia for my brother’s wedding this weekend will hopefully get at least one sandwich in for you east coasters to read about. Congrats to Evan and Liz on their big day in advance. So, Philly, what’s the sandwich that is a must have?